In the last 11 years, Florida orange production has declined more than 60 percent. This dramatic reduction in yield is attributable to multiple causes, including loss of citrus acreage in the state, citrus canker and other diseases, but huanglongbing (HLB) is now recognized as the primary reason for declining citrus yields. HLB-affected trees are thin, weak-looking and display blotchy mottle on leaves. Often, these leaves are small, have high accumulation of starch and are photosynthetically unproductive. Previous research has shown that HLB-affected trees have a reduced root system and a higher rate of root turnover. The diminished root system cannot support the existing aboveground canopy and production of fruit. As a result, the tree enters into a continuous carbohydrate stress cycle and declines in health. Imbalance of the root-to-shoot biomass is detrimental, as the vicious cycle of imbalance intensifies as the carbohydrate stress continues. Growers are urgently looking for strategies to maintain fruit production in their groves. Undoubtedly, psyllid control and good cultural practices are the most effective strategies for maintaining productivity of groves, but they take a long time to show improvement, and results are sometimes inconsistent. Moreover, these practices compound production costs. Hence, cost-effective strategies are desperately needed to keep trees productive. Pruning is one of the oldest horticultural practices that changes the form and growth of a tree. The pruning process adjusts tree shape and the ratio of framework to the fruit-bearing shell of the canopy, alters the shoot-root ratio and changes the carbohydrate (food storage) status of the tree. Proper control of vegetative growth is essential for the maintenance of productive citrus trees. Tight spacing of trees may result in poor light penetration, loss of lower foliage and fruiting wood, a shift in fruit set to the upper canopy where light is ample, and reductions in fruit yield, size and quality. Good management therefore dictates that pruning should occur before the development of these undesirable effects. Proper control of vegetative growth is essential for the maintenance of productive citrus trees. 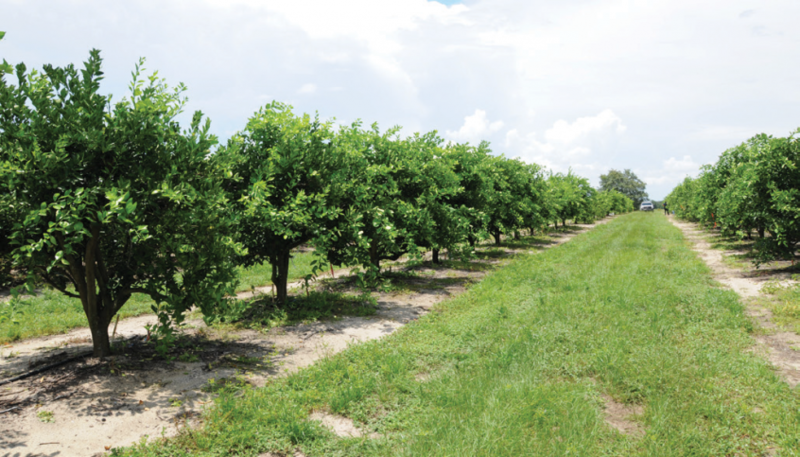 Most groves in Florida must be pruned at some time during their development to avoid problems associated with overcrowding and excessive tree height, and to improve spray coverage as well as facilitate movement of equipment within the grove. Improper pruning of mature citrus trees may reduce yields in proportion to the amount of foliage removed. The foliage of citrus trees therefore acts as an important food storage area, and heavy pruning causes the trees to produce vegetative growth at the expense of fruit production. HLB-affected trees have an imbalanced root-to-shoot ratio. Therefore, pruning to correct the root-to-shoot ratio is now being considered as an alternative strategy. In addition to pruning, it is important to promote rejuvenation of the tree, for which plant nutrition plays a critical role in regrowth and development. HLB-affected trees have a smaller root system, so the nutrient uptake is limited at any given time. Thus, it seems reasonable that a small and constant supply of nutrients throughout the growing season should provide the stressed root system with a better chance to effectively take up nutrients and water. In January 2015, a 3-year corrective pruning trial was initiated to evaluate pruning as well as source of fertilizer: conventional fertilizer (dry granular; CNV) and controlled-release fertilizer (CRF), as a means of rejuvenating HLB-affected trees. The grove of 15-year-old Hamlin on Swingle rootstock trees expressed significant HLB symptoms and produced about 160 pounds to 180 pounds of fruit per tree in 2014. The initial tree canopy size was approximately 12 feet in height and 11 feet to 12 feet in width. 4) 80 percent reduction, canopy topped and all the major branches severely pruned (buckhorned) (see Figure 1). Throughout this report, the treatments will be referred to as 0 percent, 25 percent, 50 percent and 80 percent. Within each pruning treatment, half of the trees received CNV and the other half received CRF. CNV was applied five times a year for a total of 200 pounds of nitrogen per acre. In 2015, CRF was applied two times a year for a total of 130 pounds of nitrogen per acre. In 2016, the target rate for CRF was increased to 150 pounds of nitrogen per acre applied two times a year. For this 3-year trial, the data being collected includes: percent change in tree canopy volume, preharvest fruit drop (percent), HLB symptomatic fruit (percent) and total yield (pounds). Fruit were harvested for year one of this study in December 2015. Prior to harvest, fruit drop was monitored from September to December. All the trees which were pruned produced new flush that looked healthy with no HLB symptoms (see Figure 2). The 80 percent-pruned trees grew vigorously and increased approximately 400 percent in canopy volume. However, the canopy of the trees was approximately 50 percent smaller than the 0 percent pruning treatment. A marginal increase (not statistically significant) in canopy volume was observed in the 50 percent- and 25 percent-pruned trees (see Figure 3). Surprisingly, the 80 percent-pruned trees set fruit, but yields were very low. 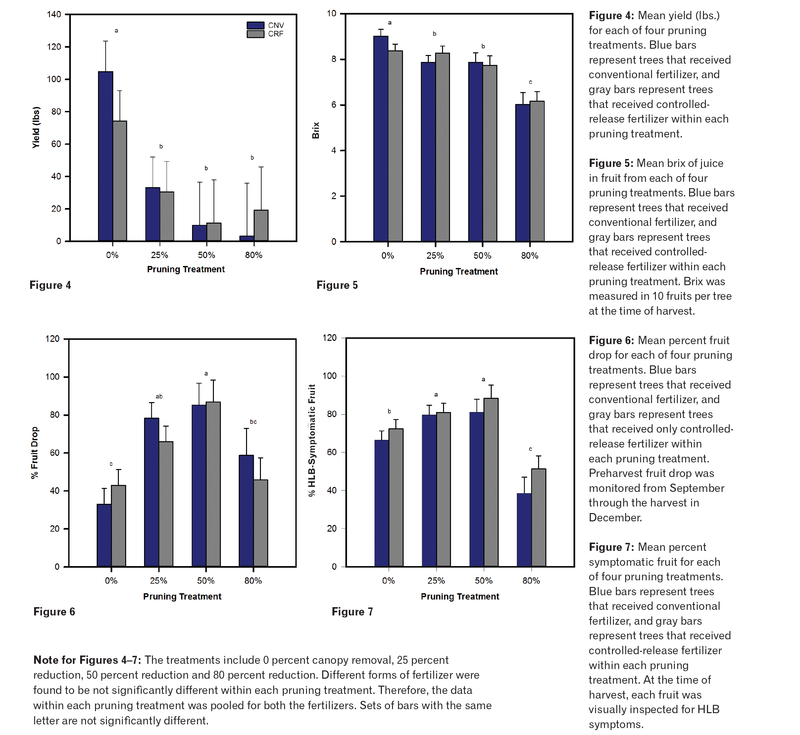 As expected, yield decreased in the 80 percent, 50 percent and 25 percent pruning treatments (see Figure 4). Canopy removal, including fruiting wood as well as flowers, contributed to the proportional decrease in fruit set and yield loss. The brix value of juice from the fruit was observed to decrease with the decrease in canopy volume. Fruit in the 0 percent pruning treatment had the highest brix, followed by the 50 percent, 25 percent and 80 percent pruning treatments (see Figure 5). In the 80 percent pruning treatment, brix was the lowest and fruit size the largest, although fruits were often dry inside. These fruits resembled fruits from a juvenile orange tree or fruit set from a stressed bloom. In the 0 percent pruning (control) treatment, about 35 to 40 percent preharvest fruit drop was observed. A significant increase in preharvest fruit drop occurred in both the 25 percent and 50 percent treatments (see Figure 6). The 80 percent pruning treatment, with a very low fruit set, retained most of the fruit on the tree. Therefore, it was excluded for scrutinizing the relationship between canopy volume and preharvest fruit drop analysis. A significant linear increase in preharvest fruit drop was observed with reduction in the canopy volume (0 percent, 25 percent and 50 percent). 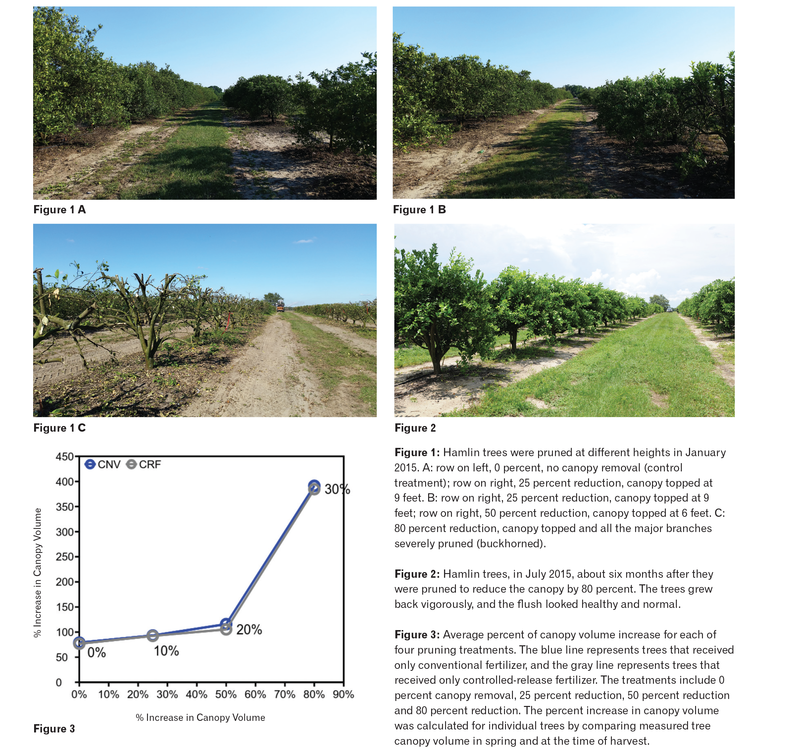 A higher percentage of HLB symptomatic fruits was observed in the 50 percent and 25 percent pruning treatments as compared to the no-pruning treatment (see Figure 7), although the 80 percent pruning treatment did not follow this trend. Possible causes of such observation in the 80 percent pruning treatment for percent symptomatic fruit and preharvest fruit drop could be significant production of new flush and a low number of fruit set. A low fruit load was well supported by the newly formed leaves and was retained on the tree. After canopy removal, preharvest fruit drop, yield, percentage of symptomatic fruit and brix responses were analyzed. It appears that pruning resulted in allocation of more photosynthate to vegetative growth in year one, instead of fruit set, growth and development. No significant differences were observed between the two forms of fertilizer for any of the measured parameters. However, it should be noted that CRF was applied two times a year and at a 35 percent lower rate of nitrogen than the conventional fertilizer. We will continue to follow these treatments over the next two years to determine if different forms of fertilizer have an effect on rejuvenation of trees. The data confirms that reduction in canopy volume results in higher vegetative growth. As the tree invests resources to restore its canopy after pruning, the fruit are also deprived of sufficient photosynthates. Consequently, preharvest fruit drop increases and fruit retained on the tree is reduced in quality with a decrease in canopy volume. Overall, the tree responses in year one are as expected. Data collection will continue for two more harvest seasons. It is expected that by year two, trees will recover from the pruning shock, and the root-to-shoot biomass will rebalance. It is suggested that if trees are significantly pruned, a substantial yield decrease in year one should be expected. After pruning, the rate of nitrogen should be adjusted to reduced canopy volume. Too much nitrogen may promote excessive vegetative activity and fruit with a thick and puffy fruit peel. Some of the fruits produced from the 80 percent pruning treatment exhibited these symptoms. During this regrowth period, attention should be paid to leafminer and psyllid control as pruning results in simultaneous emergence of new flush in all of the trees, which is attractive to foliar pests. Tripti Vashisth is an assistant professor and Troy Gainey is a senior biological scientist, both at the Citrus Research and Education Center in Lake Alfred. The authors acknowledge Everris, ICL, for donating controlled-release fertilizer for this study.